Regular use of Epsom Salt has been shown to improve and relieve the symptoms of many conditions. For soaking: Add two cups of Epsom Salts to warm water in a standard-sized bathtub. Double the Epsom Salt for an oversized garden tub. Popular for easing muscle pain and fading bruises. Bathe three times weekly, soaking for at least 20 minutes. Foot bath: Add a cup of Epsom Salt to a tub of warm water as a popular balm for aching feet. Researchers and physicians report that raising your magnesium levels may improve heart and circulatory health by reducing irregular heartbeats, preventing hardening of the arteries, reducing blood clots and lowering blood pressure. Epsom Salt flushes toxins and heavy metals from the cells, easing muscle pain and helping the body to eliminate harmful substances. Epsom Salt improves nerve function by regulating electrolytes. Also, calcium is the main conductor for electrical current in the body, and magnesium is necessary to maintain proper calcium levels in the blood. While increasing your magnesium levels, Epsom salt also delivers sulphates, which are extremely difficult to get through food but which readily absorb through the skin. Medical research indicates sulphates are needed for the formation of brain tissue, joint proteins and the mucin proteins that line the walls of the digestive tract. Sulphates also stimulate the pancreas to generate digestive enzymes and help to detoxify the body's residue of medicines and environmental contaminants. Dissolve salts in a bath of 37-39°C. Relax and soak for 20 minutes 1-2 times per week. For general skin health and wellbeing add 2 cups (approx 250gr to 500gr,) to your bath. To help relax tired and aching muscles use 2-4 cups (500g-1Kg). 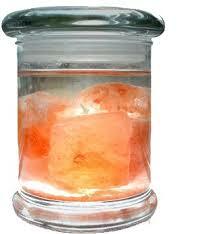 Dissolve ½ - 2 cups (approx 250g-500g) of salt in a warm 5 litre tub of approx 37°C. Relax and soak feet for up to 20 minutes, refreshing with additional warm water if needed. Red Sea Salt is alkalizing to the body as it has not been exposed to high heat and stripped of its mineral content.The method involved in harvesting this salt helps to retain its natural state and therapeutic qualities. Salt is the most important component in alkalizing the blood and tissues. The mineral content of sea salt helps to regulate the water content of the body and improves electrolytic balance of the cells. You can use it for exfoliation nasal and eye wash. Fill your bath with warm water and add 1 large cup of your bath blend. Relax and enjoy for at least 20 minutes ! Give yourself a period of rest after bathing. For a body scrub, just add 1tbsp coconut with 1tbsp of Salt,apply all over your body, especially dry areas such as heels, elbows and feet. Gently massage into your skin, rinse and pat dry. The Dead Sea salt is renowned for its therapeutic properties. For centuries people have travelled to its shores to soak in its warm mineral rich waters. Today scientific evidence proves that regular bathing and use of Dead Sea salt can helps relieve a host of common ailments. Here are some conditions that can benefit; muscular aches and pains,insomnia,symptoms of stress, joint pain,arthritis, psoriasis and eczema. For maximum benefit,fill the bath and use 2 cups of salt. Soak for 20 minutes minimum.After bathing moisturise the body and rest for 15 minutes. From a time when the Earth was pristine. From ancient mines at the foot of the Himalayas. Himalayan Salt is the purest salt on Earth. Never exposed to any environmental impurities for over 250 million years. Himalayan Salt contains all the 84 elements found in your body. Himalayan Lumps Salt is the purest salt on Earth. Never exposed to any environmental impurities for over 250 million years. Himalayan Salt contains all the 84 elements found in your body.